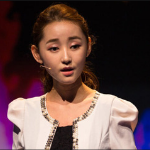 Join us on the evening of March 20th as we welcome Yeonmi Park: author, activist, and North Korean Defector. General admission and VIP tickets (includes a reception with the author and reserved seating) are available. A book signing will follow the event and books will be available for purchase. Twenty-four-year-old human rights activist and North Korean defector Yeonmi Park is fast becoming a leading voice of oppressed people around the world. At the 2014 Oslo Freedom Forum and the One Young World Summit in Dublin, she became an international phenomenon, delivering passionate and deeply personal speeches about the brutality of the North Korean regime. Her speech from the One Young World Summit has been viewed over 80 million times. In 2007, Yeonmi and her mother crossed a frozen river into China, hiding from Chinese authorities for two years before finally seeking refuge in South Korea. Yeonmi’s searing memoir about her escape, In Order to Live: A North Korean Girl’s Journey to Freedom, was released in fall 2015. Currently, a student at Columbia University, Yeonmi has published an op-ed about North Korea’s “Black Market Generation” in the Washington Post, and has been featured on CNN, CNBC, and the BBC, as well as in The New York Times and The Wall Street Journal. She serves on the board of directors of the Human Rights Foundation. This event is brought to you by EY.